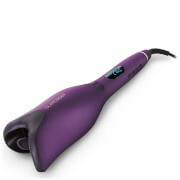 Create effortless loose waves with the BaByliss Soft Waves Hair Wand, a styling tool that delivers free-flowing volume. 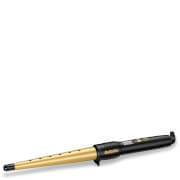 Featuring an extra-long ceramic barrel for creating natural-looking, polished waves throughout the lengths of the hair, the wand boasts an Advanced Ceramics™ heating system which ensures it is ready to use in just 30 seconds and maintains high heat throughout the styling process. After use, locks will be beachy, bouncy and full of life. Ensure the hair is dry and combed through to remove any tangles. Divide the hair into sections ready for styling. Press the button marked ‘I/0’ to turn the appliance on. Press the ‘+/-’ button to select the suitable heat setting for your hair type. 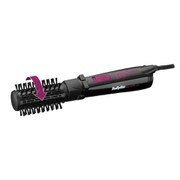 Allow the styler to heat up for a few seconds, allowing slightly longer for higher temperatures. Take a section of hair, starting 2 inches from the scalp and place the appliance next to the hair section, ensuring the end of the appliance is pointing down towards the shoulder. Start winding the hair around the top part of the barrel closest to the handle. Keep winding the hair down the length of the barrel until there is no more hair to wrap around. Hold the end of the hair in place for 5-8 seconds depending on your hair type. Then unwind or release the section of hair and pull the appliance away. Allow the wave to cool before styling. Repeat for each hair section. After use, press the ‘I/0’ button to switch off and unplug the appliance. Allow to cool before storing away.